Welcome to Dutchman's Deck at Mall of America. 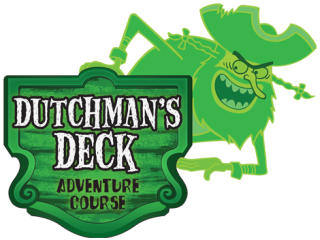 You might notice that there are now TWO attractions at Dutchman's Deck. The main attraction is still the Ghostly Gangplank ropes course. There are four levels of obstacles to conquer. They start off relatively easy on the lower level and get progressively harder as you go up. The main obstacle is the gangplank which is high above the mall below. The new addition to the complex is the Anchor Drop slides. This is included with your admission and is the new "exit" to the complex. They have a cool lighting package at night. They're pretty fun, but not overly fast.